I found this recipe in the Fiber35 Diet book. I altered it to my liking as usual and it’s wonderful. I thought making a sandwich without mayo is un-heard of but this sandwich is amazing! Mix hummus, yogurt and green onion. Cut chicken into 1/2″ cubes. Add chicken to the hummus mixture and stir well. 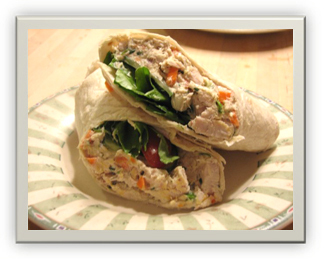 Lay wheat tortilla, baby spinach, add chicken mixture, then carrot and tomato. Roll firmly into place and chow down and slice in half. It’s chow time! Makes two sandwiches.